I don’t know why it took me so long to post this recipe, as these duck tacos are a perfect thing to do with confit. Duck confit, if you are not familiar, is duck or goose that is salted, then slowly cooked in its own fat until it is meltingly tender, and then, often, crisped up before you eat it. 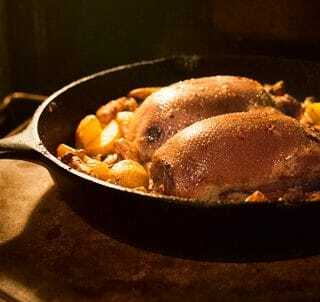 , and I do have a duck confit recipe on this site. It is also a perfect make-ahead meal. Once made, the confit will keep in the fridge for a month or more. , which you can find in most Latin markets or online. Or you can make it. Here’s how: Mix into a paste 2 tablespoons black peppercorns, 2 tablespoons oregano (Mexican if you can get it), 2 teaspoons cumin, 1 clove, 5 allspice berries, a pinch of cinnamon all ground together with a roasted head of garlic (here’s how to roast garlic) and about a tablespoon of vinegar. The effect is amazing, and will take you to tropical Mexico if you’ve ever been there. 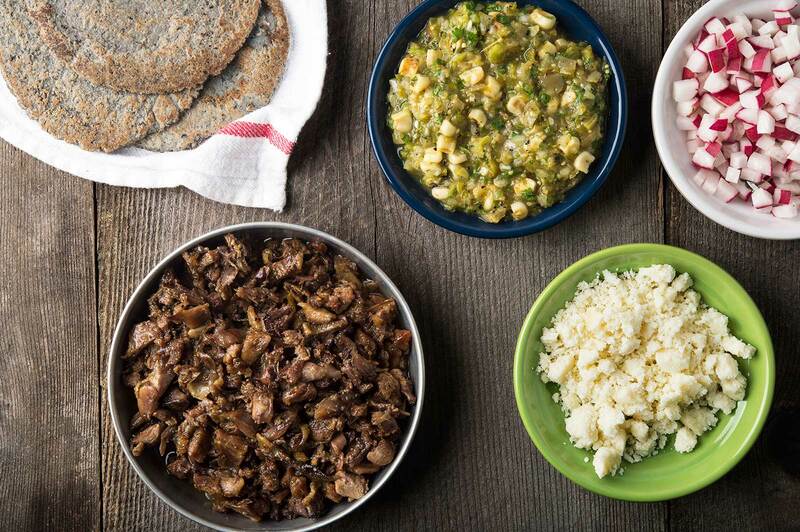 That’s the base of this recipe, but you’ll want lots of taco accompaniments to go with it. Good tortillas (I made my own from blue corn masa I got from my friends at Nixtaco, a local taqueria), some crumbly cheese, something crunchy like diced radishes, cilantro and a salsa of your choice. It is springtime as I write this, so we have nopalitos in the markets now. Nopalitos are young paddles off the prickly pear cactus. I mixed these with some corn kernels and my regular tomatillo salsa verde. It was really, really good. Better than I’d thought it would be, actually. Incidentally, the tomatillo salsa is also a make-ahead thing, as it can be canned and kept in your pantry. But don’t get all hung up on it. Use any salsa you like. You will need duck confit (recipe is here) to make this, but know that once confit is made it keeps in the fridge for a month or so, and freezes well. If you made the achiote verde it will keep a long time in the fridge. The salsa will not, however. You need to eat that within a day or so. Have everything set before you begin, as this will come together quickly. 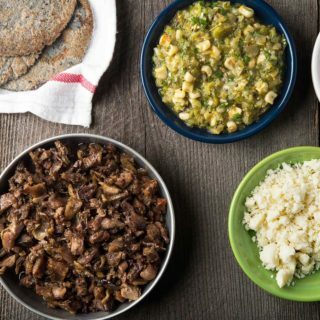 Either buy or make the achiote verde, and make the tomatillo salsa verde ahead. Boil the diced cactus paddles in salted water for 12 minutes. After they've boiled 5 minutes, add a pinch of baking soda; this helps the cactus keep its color and reduces slime. Shock the cactus in ice water to cool. 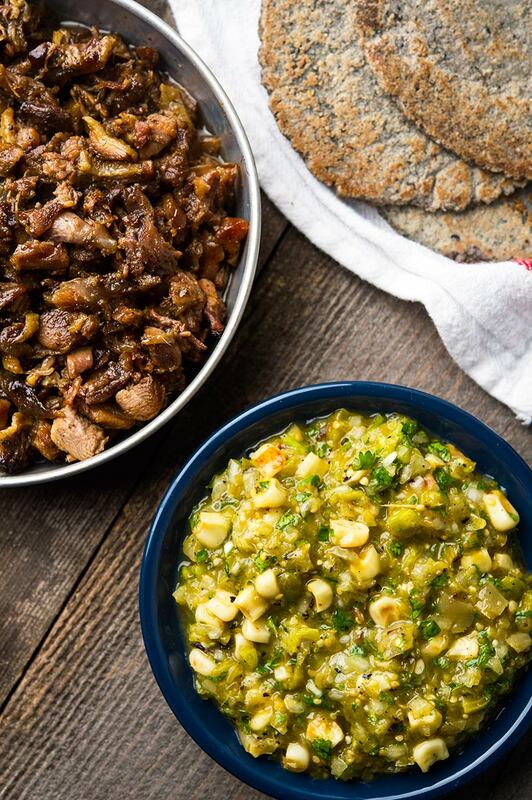 To finish the salsa, mix together the salsa verde, the corn and the cooked, cooled cactus paddles. Set aside. Lay the chopped confit in one layer in a large frying pan with as much of the confit fat as you'd like; I use a good 1/4 cup. Sear over high heat for 90 seconds without touching so you get some crispy bits. Stir, and add the achiote verde and the chicken broth. Boil this away until the pan is almost dry again. When you hear the cooking switch from boiling to sizzling, turn off the heat. Serve with warm tortillas, the salsa and any other accompaniments you'd like. I used 6 specklebelly goose legs for what you see in the bowl. Four or 5 domesticated duck legs would be equivalent, as would about 12 to 18 mallard legs. You can find nearly 100 recipes for all kinds of ducks and geese, wild and farmed, here on Hunter Angler Gardener Cook! This is great! I am not a big duck fan but the way you talk about it and photograph it I’m sold! looks absolutely delicious! Man, this looks delicious! Duck confit takes a long time to prepare, so this is a great recipe — you want to enjoy it for as long as you can. Also, I recently made achiote verde for the first time, and came out REALLY well. Very proud of myself. And I’m so glad you mentioned the nopalitos. I recently had these in salsa verde for the first time, and they were FANTASTIC.